If only there were some kind of potion or pill that had everything you needed for weight loss and good health. Unfortunately, no such pill exists, but there is a solution — something that not only promotes wellness and weight control but tastes good, too. These multitasking “super foods” provide multiple disease-fighting nutrients, fill you up so you can enjoy plenty of food without excess calories, and are easy to include in everyday meals. After all, what good is a super food that is hard to find, difficult to prepare, and the kids won’t eat? Eaten regularly, these foods will help you satisfy the recommendations of the U.S. government’s 2005 Dietary Guideline, giving you nutrients that are typically missing from American diets. According to the Guidelines, Americans need to eat more fruits, vegetables, whole grains, and low-fat dairy products. Of course, experts are quick to point out, this list of top 10 super foods by no means includes all the nutritious foods that should be part of a healthy diet. “What is ultimately the most important to good health is a dietary pattern that includes all these foods, along with a wide variety of other nutritious foods and regular physical activity,” says Tufts University researcher Alice Lichtenstein, DSc. And don’t forget that portion size matters, even when it comes to healthy foods. You can take more liberties when eating simply prepared vegetables, but you should take care to eat other super foods in sensible portions. “Foods like nuts are nutrient rich, but if you overeat them you can pack on the pounds, and that defeats the purpose,” says Elisa Zied, MS, RD, author of Feed Your Family Right! Low fat or fat-free plain yogurt is higher in calcium than some other dairy products and contains a great package of other nutrients, including protein and potassium. It can also be enhanced with other good-for-you substances. “Yogurt is a vehicle food that can be enriched with probiotics for a healthy balance of bacteria in your gut, and beneficial, heart-healthy plant stanols,” says Zied. “And lactose sensitive people may tolerate yogurt better than milk.” Look for plain yogurt fortified with vitamin D, and add your own fruit to control sweetness and calories. Versatile yogurt can also be used in entree and bakery recipes , in dips for veggies, etc. Don’t like yogurt? Skim milk is another super dairy food that has only 83 calories per cup and is easy to slip into coffee to help you get one of the recommended three servings of dairy each day. “Dairy foods contain practically every nutrient you need for total nutrition — and in just the right balance,” says bone health expert, Robert Heaney, MD. “No other food group in the diet is as complete or as economical.” Eggs make the list because they are nutritious, versatile, economical, and a great way to fill up on quality protein. “Studies show if you eat eggs at breakfast, you may eat fewer calories during the day and lose weight without significantly affecting cholesterol levels,” says Elizabeth Ward, MS, RD, author of The Pocket Idiot’s Guide to the New Food Pyramids. Eggs also contain 12 vitamins and minerals, including choline, which is good for brain development and memory. Enjoy them at any meal or hard-cooked as a portable snack. Nuts have gotten a bad rap because of their high fat content. But their protein, heart-healthy fats, high fiber, and antioxidant content earn them a place on the top 10 list. The key to enjoying nuts, experts say, is portion control. “All nuts are healthful in small doses, and studies show they can help lower cholesterol levels and promote weight loss,” says Today Show nutritionist Joy Bauer, MS, RD. “I like pistachio nuts because they also contain plant sterols and it takes longer to crack the shell and eat them, making it easier to control the portion. Whether you prefer pistachios, almonds, peanuts, walnuts, or pecans, an ounce a day of nuts help fill you up. Nuts add texture and flavor to salads, side dishes, baked goods, cereals, and entrees. They taste great alone, too. Zied recommends putting together your own “100-calorie packs” of nuts for easy and portable snacks. Kiwis are among the most nutritionally dense fruits, full of antioxidants, says Ward. “One large kiwi supplies your daily requirement for vitamin C,” says Ward. “It is also a good source of potassium, fiber, and a decent source of vitamin A and vitamin E, which is one of the missing nutrients, and kiwi is one of the only fruits that provides it.” The sweet taste and colorful appearance of kiwis makes it easy to slice in half, scoop out with a spoon and enjoy alone, or slice it into desserts, salads, or side dishes. Kiwifruit can also have a mild laxative effect due to their high fiber content. Quinoa is now readily available in many supermarkets and is one of the best whole grains you can eat, according to Zied. “It is an ancient grain, easy to make, interesting, high in protein (8 grams in 1 cup cooked), fiber (5 grams per cup) and a naturally good source of iron,” she says. Quinoa (pronounced keen-wa) also has plenty of zinc, vitamin E, and selenium to help control your weight and lower your risk for heart disease and diabetes , she says. Quinoa is as easy to prepare as rice and can be eaten alone or mixed with vegetables, nuts, or lean protein for a whole-grain medley. Try to make at least half your daily grain servings whole grains. In addition to quinoa, try barley, oats, buckwheat, whole wheat, wild rice, and millet. Beans, beans, good for your heart — really! Beans are loaded with insoluble fiber, which helps lower cholesterol, as well as soluble fiber, which fills you up and helps rid your body of waste. They’re also a good, low-fat source of protein, carbohydrates, magnesium , and potassium. Bauer favors edamame (whole soybeans) because they also contain heart-healthy omega-3 fatty acids. Beans can easily substitute for meat or poultry as the centerpiece of a meal, says Bauer, but they also work as a side dish, or tossed into soups, stews, or egg dishes. The U.S. Dietary Guidelines recommend 3 cups weekly. Salmon is a super food because of its omega-3 fatty acid content. Studies show that omega-3 fatty acids help protect heart health . That’s why the American Heart Association recommends eating fatty fish like salmon twice weekly. Salmon is low in calories (200 for 3 ounces) has lots of protein, is a good source of iron, and is very low in saturated fat. You can simply grill or bake it, top it with salsas or other low-fat sauces, or serve it on top of salad greens. If you don’t like salmon, Lichtenstein recommends eating other kinds of fish, like canned tuna. And what about the mercury content? (Mercury is known to accumulate in fish.) “The benefits of eating salmon or other fatty fish twice weekly far outweigh any risks, but if you are concerned, check with your doctor,” says Zied. Broccoli is one of America’s favorite vegetables because it tastes good and is available all year long. It’s a rich source of vitamin A, vitamin C, and bone-building vitamin K, and has plenty of fiber to fill you up and help control your weight. “Some people think beta-carotene (vitamin A) is only found in orange and yellow vegetables, but broccoli is an excellent source,” says Ward. 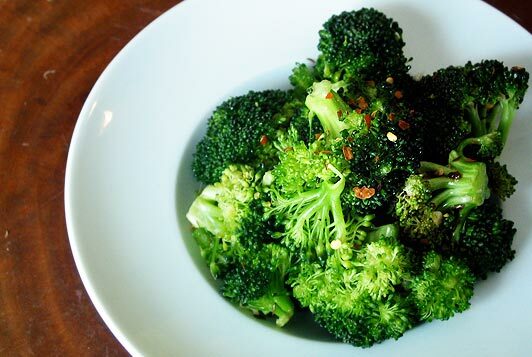 You can eat broccoli raw, lightly steamed, stir-fried, roasted, or grilled. Eat it as a side dish, or toss into grains, egg dishes, soups, and salads. Sweet potatoes are a delicious member of the dark orange vegetable family, which lead the pack in vitamin A content. Substitute a baked sweet potato (also loaded with vitamin C, calcium, and potassium) for a baked white potato. And before you add butter or sugar, taste the sweetness that develops when a sweet potato is cooked — and think of all the calories you can save over that loaded baked potato. “If we eat more foods like sweet potatoes that are rich sources of potassium, and fewer high-sodium foods, we can blunt the effect of sodium on blood pressure and reduce bone loss,” says Zied. Other dark orange vegetable standouts include pumpkin, carrots, butternut squash, and orange bell peppers. Berries pack an incredible amount of nutritional goodness into a small package. They’re loaded with antioxidants, phytonutrients, low in calories, and high in water and fiber to help control blood sugar and keep you full longer. And their flavors satisfy sweets cravings for a fraction of the calories in baked goods. Blueberries lead the pack because they are among the best source of antioxidants and are widely available. Cranberries are also widely available fresh, frozen, or dried. All can add flavor and nutrition to numerous dishes, from salads and cereals to baked goods and yogurt. Among other duties, she serves as senior nutrition correspondent; writes features, columns, and diet book reviews; provides expert editorial review of diet and nutrition articles; and covers national meetings…Zelman has been a dietetic internship director at Ochsner Medical Institutions and assistant professor of nutrition at St. Mary’s Dominican College, both in New Orleans. She has extensive experience working with children and weight management clients, chefs, and restaurants in analysis and development of healthy recipes. Zelman is active in local, state, and national dietetic associations. She was elected to serve as the director-at-large on the American Dietetic Association board of directors for a three-year term. She served as a trustee of the Georgia Dietetic Foundation and two terms as the Georgia delegate to the American Dietetic Association. She received her master’s degree in public health from Tulane University and her bachelor of science from Montclair State University. Kathleen Zelman, MPH, RD, LD, is director of nutrition for WebMD, overseeing diet, nutrition, and food information.Zelman has extensive media experience, including co-hosting a weekly radio program, 12 years as a national spokeswoman for the American Dietetic Association, and numerous print and television appearances including CNN, Good Morning America, NBC Nightly News, The Wall Street Journal, and The New York Times. In 2007, Zelman was awarded the prestigious American Dietetic Association “Media Excellence Award” for her contribution and commitment to educating consumers about food and nutrition issues through the media. In 2011, the American Society for Nutrition awarded Zelman the Nutrition Science Media award for fostering the public’s understanding of nutrition issues. She is a contributing writer for newspapers, magazines, and books, including Paul Prudhomme's A Fork in the Road, Healthy Eating for Babies and Toddlers, and A Harvest of Healing Foods. More below.